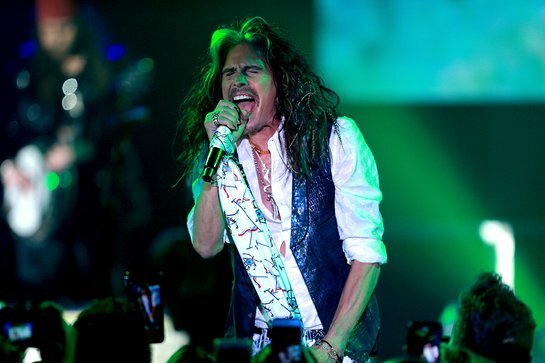 During the weekend, iconic singer, songwriter, humanitarian, Rock and Roll Hall of Fame inductee and four-time GRAMMY Award winner Steven Tyler, and Live Nation celebrated the inaugural Janie's Fund Gala with an exclusive live viewing of the 60th Annual GRAMMY Awards telecast, elegant dinner, and unforgettable night of performances at the historic RED Studios Hollywood. Celebrities, VIP guests and Janie’s Fund supporters in attendance included Alice Cooper, Ashlee Simpson & Evan Ross, Ashley Tisdale & Christopher French, John Corbett & Bo Derek, Caitlyn Jenner, Cheech Marin, Chelsea Tyler & Jon Foster, Cody Simpson, David Foster & Katharine McPhee, Francesca Eastwood, Haley Reinhart, Jason Sudeikis & Olivia Wilde, Joey Kramer, Matt Sorum, Melissa Peterman, Moby, Nina Dobrev, Nuno Bettencourt, Pete Wentz, Randy Jackson, Ruby Rose, Sharon Stone, Sophia Hutchins, Suzanne Sommers, Terry Crews and more. Following the star-studded red carpet arrivals, Tyler hosted guests at an intimate VIP cocktail reception – true to his style, the transformed rock ’n roll chic space featured custom velvet drapes and glowing chandeliers with hanging scarves. The London Essentials entertained guests roaming around the party performing acoustic classics and ushering the guests into the decadent ballroom to watch the GRAMMY Awards telecast live. The inaugural gala was capped off with Sharon Stone introducing Tyler and his Nashville-based band, LOVING MARY, who performed the classic hits “Sweet Emotion,” “Dream On,” “Jaded”, and more. The jovial crowd was surprised when Nuno Bettencourt took the stage performing his hit “More Than Words” with Tyler. During “Walk This Way,” Tyler was also joined by Aerosmith’s drummer Joey Kramer and a West African drumming group featuring the girls supported by Janie’s Fund.